The first LG UltraFine display is a 21.5" 4K model. 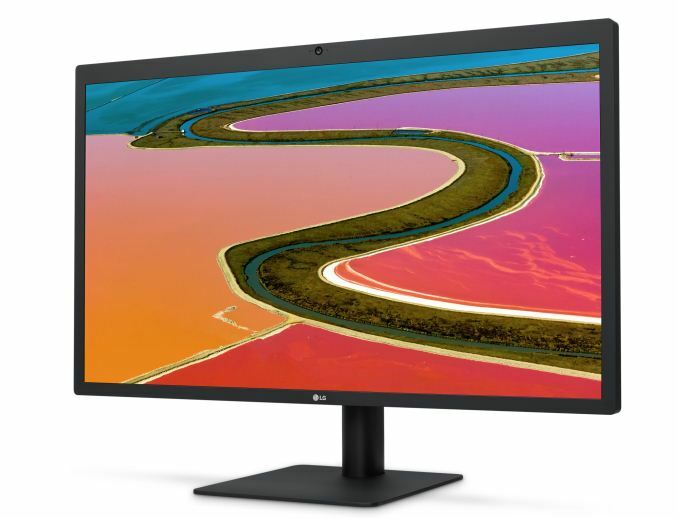 Unlike most "4K" displays which really use the 3840x2160 resolution defined in the UHD spec, this is a 4096 x 2304 display that actually has over four thousand pixels on its longer axis. The 27" model is a 5K panel with a resolution of 5120 x 2880. Both monitors connect over a single cord. In the case of the 4K model it can be driven using a single DisplayPort 1.2 stream over a normal USB-C port. 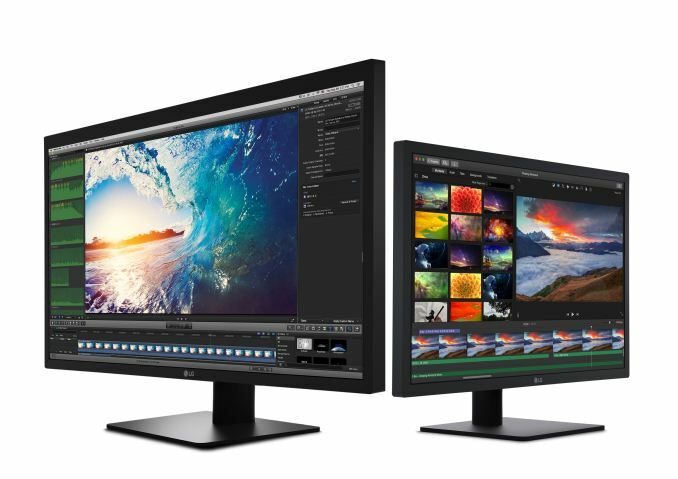 The 5K monitor requires two DisplayPort 1.2 streams and so it is a tiled display. However, using Thunderbolt 3 for the link avoids the dual-cable solution used on existing 5K monitors. These solutions also allow for data and power transfer, and so the monitors can actually charge a connected laptop while also providing three 5Gbps USB-C ports and stereo speakers. The panel characteristics for both displays are similar. Both have a peak brightness of 500 nits, and they use the P3 color gamut, although it's almost certain that they retain the standard 2.2 gamma and white point of D65 from existing displays. The one key difference to note is that the 21.5" model is only an 8bit display, with support for 16.7 million colors, while the 27" model is a 10bit display supporting 1.07 billion colors. The 27" model also has a camera and a built in microphone for audio and video calls. At this point you may have noticed that all of these specs are the same as Apple's iMacs. LG Display makes the IPS displays in the iMacs, so it's very likely if not certain that these are the same panels. Given that these monitors are targeted at users of the new MacBook Pro, it's also very likely that they do not have any sort of sRGB fallback mode, as such an option is unnecessary on macOS where there is end to end color management in any AppKit app and even in most apps that don't use AppKit. This is important to keep in mind for anyone interested in buying these for a Windows computer. The state of color management on Windows means that in nearly every application you'll be stuck with oversaturated colors and no workaround, so I wouldn't recommend it even if it can work. While I'm on the topic of Windows support, I will say that from a technical perspective, the displays should work with a Windows computer. However, product listings for the monitor specify that you need a Mac with USB-C for the 4K model, and a Mac with Thunderbolt 3 for the 5K model. This limits the 4K model to Apple's MacBook, and the new MacBook Pros, with the 5K model only working on the latter. This also ties back to the integration with macOS. Most monitors use physical buttons for controlling brightness and volume, but the LG UltraFine displays use the integrated controls that macOS provides, meaning that it can respond to the volume and brightness keys on Mac keyboards. It doesn't look like the monitors have any buttons to fall back on, so this may be another situation where Windows users should be wary, and it definitely explains why the monitors are being marketed specifically for their integration with macOS. Both of LG's new UltraFine monitors have already shown up online, although you can't buy them directly from Apple's online store as of right now even if you'd like to purchase one alongside a new MacBook Pro. The listings do tell us that the 4K model is priced at $699.95 in the US, and the 5K model is $1299.95. According to LG, the 4K model will be available next month, and the 5K model will launch in early December. Perfectly understandable if you look at the demographics of that market. overpriced 4k 8 bit 21.5" monitor, why would anyone buy this?